“We are saddened because staff members of Reporter’s Notebook and Powerhouse were no longer allowed to work after their contracts expired. Instead of reinstating talents, they are making matters worse by terminating more amongst our ranks,” shared Talent Association of GMA-7 (TAG) president Christian Cabaluna during a press conference on Wednesday (July 1). Last June 25, the National Labor Relations Commission (NLRC) handed down a resolution in favor of GMA talents who filed a regularization case against the media giant. The labor arbiter ordered GMA-7 to recognize 107 talents as regular employees and reinstate them . “The decision of the labor arbiter is being disregarded [by GMA-7],” lamented Cabaluna. Talents are skilled professionals working for GMA 7’s television programs. Unlike regular employees, talents do not have security of tenure as they work on a per show basis. “We [talents] are like David taking on the giant Goliath, but we were not afraid. We know our rights,” said TAG member Chloe Garcera-Ben. TAG President Christian Cabaluna (left) and Gabriela Women’s Partylist representative Emmi de Jesus (right) holding placards calling for the end of contractualization. However, this did not sit well to some program managers of GMA 7, according to Garcera-Ben. She said some program managers of the public affairs division wore black shirts the day after the NLRC ruling was issued. “If there’s anyone who would understand what we are going through, it should be them because they were once talents too,” lamented Chloe Garcera-Ben. “TAG members are not the only ones who would reap the benefits of our victory. The network will benefit too. If employees are happy, they would be more productive,” explained Garcera-Ben. GMA 7 has until July 6 to contest the NLRC decision. “The NLRC decision is a step forward the right direction, but the fight is far from over. 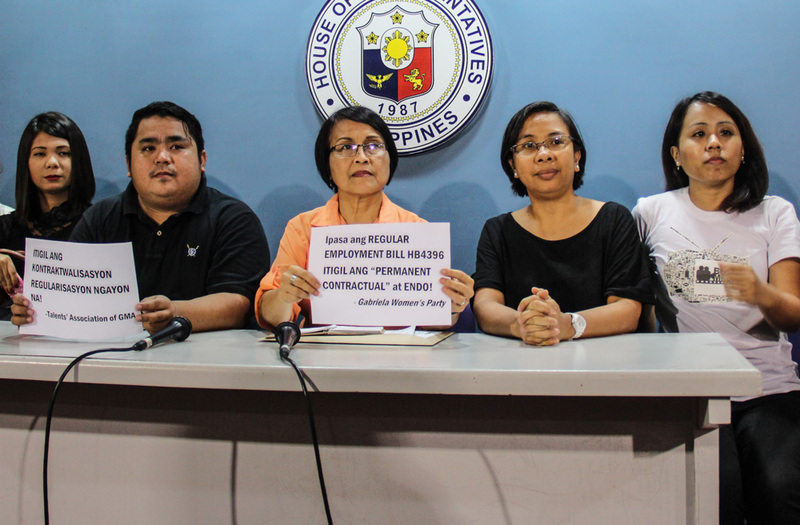 Much is needed to be done,” said Gabriela Women’s Partylist representative Emmi de Jesus in a press conference at the House of Representatives. TAG members attended the presscon to support the bill and share updates on their situation following their initial victory at the NLRC. In an effort to prohibit contractual employment, Gabriela partylist filed House Bill 4396 or the ‘Regular Employment Bill’ last May 2014. The bill has gone only through its first reading in Congress last year. “For as long as there is no law ensuring workers’ rights to job security, we will continue to push for HB 4396,” added de Jesus. “We encourage all workers who suffer the same problem of contractualization to unite,” said Chloe Garcera-Ben. “The labor arbiter’s decision has proven that collective action bears positive results,” she added.